It’s 4th grade take 3 here at Lextin Academy. This year I have a very precocious, dramatic, and sometimes argumentative 4th grader. She’s a little advanced, so she often jumps in with her older brother and does the same curriculum with him. It’s been so nice to combine them for a few subjects. So, when I planned our year, I chose some curriculum for math and language arts that were specifically for her. Then I chose Latin, Spanish, science, and Bible that she could do alongside her brother. And then we do history together as a group with older and younger siblings. 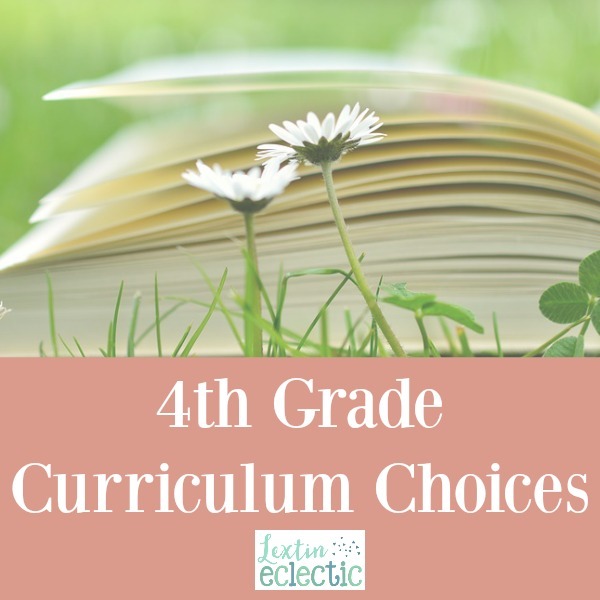 Here are my curriculum choices for 4th grade – some are tried and true favorites and others are new to us. My 4th grader and her older brother read the lessons to me and then work on the assignments together. This is done independently and then I grade the assignments and tests. My daughter is enjoying being able to work on her own. She does a few pages in this program each week for extra review and practice. We spend about 10 minutes a day on grammar together and then she does some of the assignments on her own. It’s been fast and efficient. My 4th and 5th grader do these books together. I read out the words or sentences and they write them on whiteboards. It’s saving so much time to be able to do one spelling level with two kids! This is a DVD based program. My daughter watches the video each day and then works on assignments independently. Then we review her work together. We have a lot of fun reading the story excerpts together and then discussing them. This is great narration and dictation practice (even if the dictation is very challenging!). I don’t plan to use the next and final level of Writing with Ease. Completing up through level 3 is plenty! This is another subject that is combined with her older brother. They watch the DVD’s together and then I help them review and practice. This is her first year of Latin and she’s working on this program with her brother as well. We read these books together. Usually I read aloud from one of the chapters and then we create an outline of the section that we read. Each child copies the outline from the whiteboard to keep it in their notebook. We watch this online during lunch. This year we are covering the middle ages. No, it doesn’t coincide with our other history but it’s a fun break from our regular studies and my kids love it! She is finishing up BJU science 4 with her brother and then they will work on Science 5 together. These are extra books for fun based on her interests and her brother’s interests. They are both reading through these books independently. We do geography together. I read about one country and then we practice finding the countries on maps and talk about the various facts about the countries. We also practice the states and capitals each day. She will work on a few logic books throughout the year. We love books from Prufrock Press and the Critical Thinking Company. We read poetry together each day before we start working on school work. Here are the fun books that we read. My 4th grade girl also has piano, swim team, Junior PGA golf, and Chinese. Of course, she also has a bunch of wonderful books to read during her independent reading time.